ZynBit relies on the concept of an Admin user to choose licenses and approve users for their organization. The first user to sign up for a ZynBit account becomes that Organization’s Administrative user. This Admin is responsible for payment and for managing participation in that organization by additional ZynBit users. By default, the organization is defined by the email domain of the company. 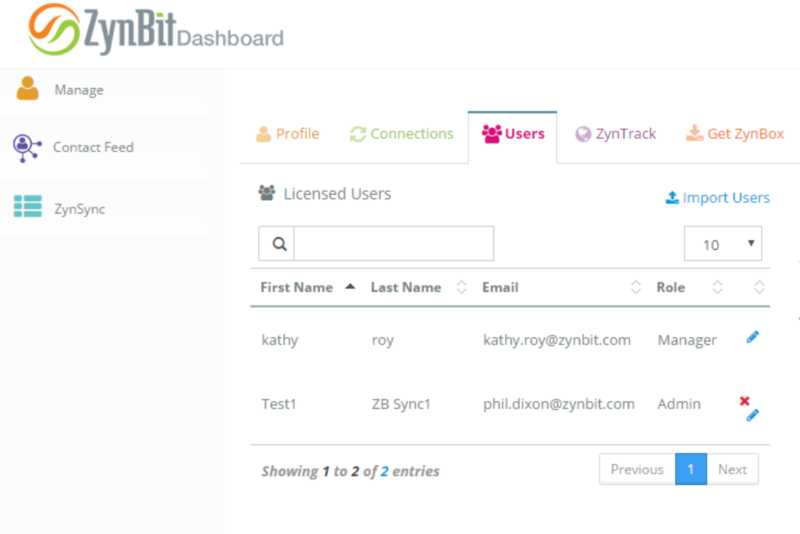 The ZynBit Administrator is provided with the ability to share management rights with appropriate users. To edit a user profile, click the pencil beside their name, and the Edit Profile Screen will appear where the user role can be changed from “User” to “Manager”. This will enable the person to see the Manage Users tab, where they can invite users to the organization, or delete them, as appropriate. A user cannot delete themselves, however, any admin can delete any user other than themselves. When a user is deleted by clicking the red x, the user’s ZynBit account will be deleted. In addition, an informational message will appear indicating that data associated with the account will be deleted. The data indicated is NOT the emails which have been attached in Salesforce. Those are unaffected. The data deleted is the contract tracking and response data associated with the inbox being removed from the organization. This would include information about who read the former users email and what website visits were generated, and so on. This image illustrates a company with an Admin and a Manager. (Note that the screen does not contain the licensing tab, indicating that the user kathy.roy@ZynBit.com has a role of Manager, not Administrator.